What a world of profit and delight, when you wake up, dress up and show up like a useful person. This world will bite us down, grind us or walk over us if we have nothing at our disposal to do or flaunt. One has to pull up his socks and get the things done because till how long you will enjoy doing nothing? There will for sure a time bangs in when you will stand up not only for yourself but also for your family. Earning livelihood is not a habit or ritual that is being followed since the birth of mankind, it is the necessity and indispensable aspect which cannot be denied or undermined. It is necessary for the survival and to stay away from a living of hand to mouth. The first step is education, that leads to the second step of knowledge and wisdom, then comes skill & talent and the last step that follows is practicality & implementation. That’s the point which decides what will be your professional fate and where your destiny will take you. Success is only determined by the hard work and workaholic spirit you show up. Have you ever seen a man doing nothing and leading a big enterprise? Well that’s impossible or perhaps he was born with a silver spoon. But make sure if you are an adult, getting a skill and working it out is the responsibility of yours for a better living. Never underrate yourself because we are born with capacity and potential, it is now in our own hand that how we utilize this on the show. Artists are appreciated everywhere because of their work and professionalism. They deal with their clients equally and present the best selves at their work places. Graphic designers are not out from this queue because they believe in, ‘no pain, no gain’. They always look up for inspiration and then inject their own school of thought into whatever they are up to designing. 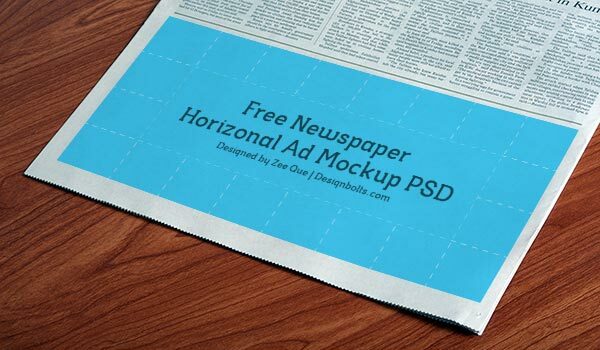 Today I am unfolding before you free horizontal newspaper Ad mockup PSD. Simply insert your own ad design into this mockup to show it to your client so he will have a sharp and direct idea how the advertisement is going to look in the newspaper. Stay here because more is yet to come your way in the next weeks. Note: Linkback required for sharing online.